See Inbounds - baseline Fraschilla P series. 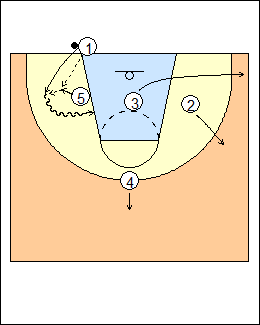 5 cross-screens for 3, 4 downscreens for 2, 1 inbounds to 3, who passes to 2 if he has no shot. 4 screens for 1 coming in opposite the inbounds pass. 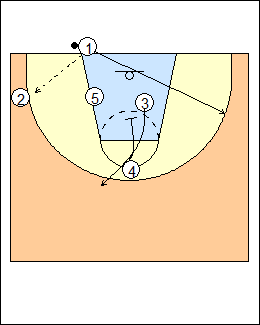 Fraschilla - can run floppy action with 1 as the runner. 3 and 5 stagger screen for 2, 5 steps to the ball. 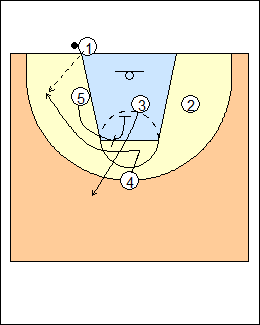 1 looks for 5, inbounds to 2 and comes in opposite, 4 downscreens for 3. 3 upscreens for 4, 5 screens for 3 and comes back to the ball, 2 pops out top as safety. 1 looks for 4, 3, and 5. 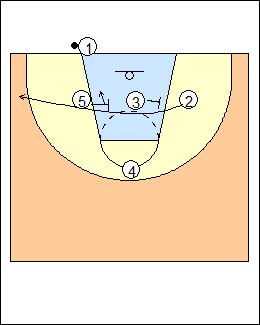 1 inbounds to 5, steps in for a handback and looks to drive middle, 2 and 3 spot up on the perimeter. Chris Oliver - pop - a call or a read, inbound the ball directly to the ballside post, attack or go to a two-man game with the inbounder coming in for a hand-off (guard pop - a ballside guard pops for the inbound pass, get a quick corner ballscreen with the post). 4 fakes a basket cut and uses a screen from 5, who keeps going to screen for 3. 1 inbounds to 4 who looks to shoot or otherwise pass to 3. 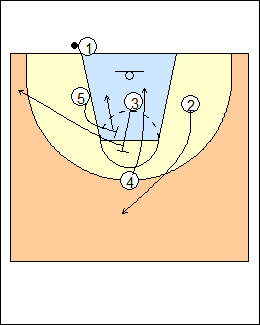 (Variation - 3 backscreens for 5, screen-the-screener).